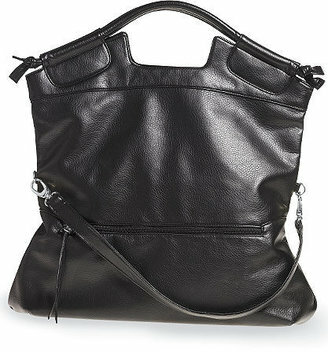 The knockoff is inspired by none other than Foley + Corinna's popular Mid City Tote, which retails for $444 at Tobi.com. Piece of cake, right? As usual, this under-a-rock resident had no idea. And luckily, I prefer the knockoff, as a dedicated lover of silver hardware! Foley & Corinna of course!! Yes Corinna she came out with the bag Fall of '06 I believe. Its a great bag. I wanted it but it was too expensive. There is a bag company that I can't remember the name of but they do a really nice leather replica for $99 dollars. This bag in faux leather looks horrible. Everybody from F21 to Bitten has tried to copy this bag. Bt then again Corinna copied this bag from the 70's. She is not original either. Betsey Johnson has a nicer version of this. I heart my foley + corinna! Got it on sale at bloomingdales!